No matter how you look at it, the gym is a place where people from various walks of life go to exercise. This means that while you and the other people at the gym have a common interest of working out, it doesn’t mean that everyone is as nice as you would want them to be. Stories about gym douchebags have been around since public gyms were made. Some of these guys intentionally make themselves d-bags for the sake of being the alpha male in the group, while some are just completely oblivious to their actions. My spot, my spot, my spot. You’ve probably encountered that gym douchebag that hogs all the equipment. When he goes out to get a drink, he expects the bench to still be available. Why? It’s his spot, apparently. This action is one of the concepts newbies fail to realize on their first day at the gym – once you leave the spot, it’s no longer yours. Apparently, some guys were never corrected, or they simply enjoy hoarding all the equipment – like marking their own territory. Just be thankful that they don’t piss on it like dogs do. One of my pet peeves at the gym is using gym equipment soaked in sweat. I make it a point that I wipe down my equipment before leaving, and seeing that others don’t do the same ticks me off. What’s even more appalling is that some d-bags know that others are in line to use the equipment, and yet they deliberately ’forget’ wiping down the equipment. Whoever came up with gym mirrors probably did not foresee that it will breed a new generation of gym d-bags that are madly in love with their physique, flexing their muscles in the mirror and taking cringe-worthy selfies. If you’re going to the gym to take pictures of yourself, please do yourself favor and do it where you are not a distraction to everyone else. This guy secretly wants to work as a trainer, but he doesn’t. He lets everyone know that he knows more than them by showcasing his Google-acquired knowledge. He’s the kind of person who will talk to you about correcting your form and tells you that you’re doing it all wrong. I mean, thanks for the advice, but if I wanted a personal trainer, I would have asked for one. Some just find it more intense to yell while they are doing their reps for some reason – I understand that. I occasionally yell myself, but not as loud as to draw attention to myself. Whether it’s because of sheer intensity, or some just want to be the alpha male in the group, unnecessary yelling is never welcome. How about it? 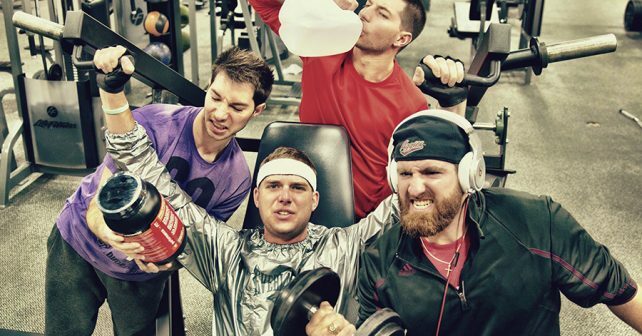 Gym d-bags either do not know or simply do not care – but now you know. What you do next is up to you.